RSVP NOW - LIMITED FREE TICKETS AVAILABLE! A new year and new political shift is once again upon us, and savvy investors want to forecast what’s in store for them in 2019 and beyond. On SATURDAY, MARCH 9TH, creative real estate leaders will unite in OLD TOWN PASADENA, THE HEART OF LOS ANGELES to discuss such trends, ideas and strategies. This insight and knowledge may help guests gain an edge for a favorable and prosperous new year. 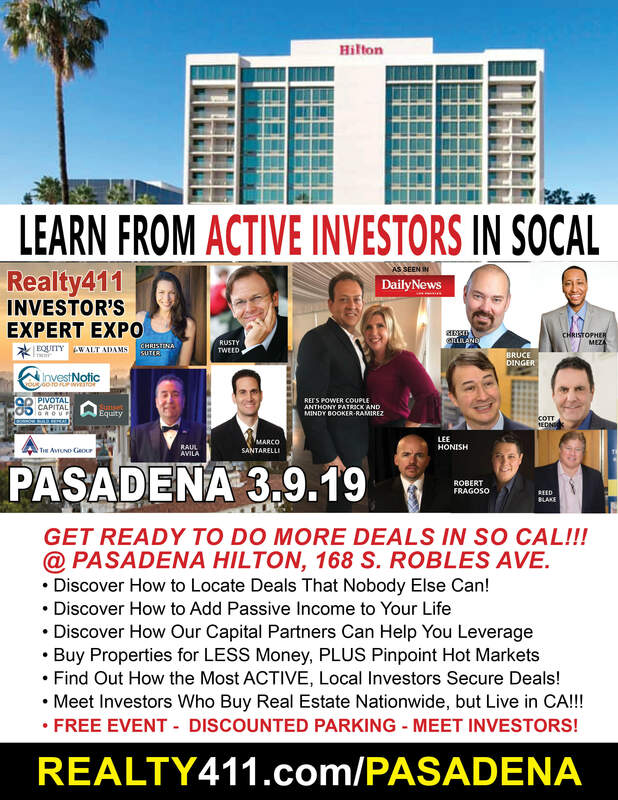 Hosting this community and family-friendly FREE Investor’s Expo is REALTY411, (http://realty411expo.com) the original realty investor magazine. REALTY411 (http://realty411Magazine.com) is celebrating its brand new publication, as well as an anniversary of five years in producing their digital issue, REI WEALTH(http://reiwealthmag.com), a monthly interactive publication. As one of the most prolific publishers in the real estate investment industry, REALTY411 has dozens of events on schedule for 2019, as part of their national tour to celebrate another year of success in publishing, and in real estate as active investors. Join Us in the Heart of Historic Old Town Pasadena! Sponsorship & speaking opportunities are available, let us exponentially grow your business! We are the company that has propelled many to expand their business in the REI marketplace. We have hosted more investor events, in more cities and states, than any other privately-owned REI media company. We pride ourselves in procuring phenomenal results for sponsors and speakers: 310.994.1962. For this reason, Realty411 has been in business longer than any other company in our niche. Realty411 is the innovative force followed by many others in the industry. Our resources have assisted investors for the past twelve years. Realty411 has only ONE mission: To Help Our Readers Succeed. We are a positive force in the industry with zero bankruptcies, lawsuits, Rip Off Reports, consumer complaints, nor foreclosures in our background. Additionally, the publisher has owned properties in three counties in California, and throughout the nation. Please call us for any questions or concerns: 805.693.1497.